I made my quince gin as a way to use some of those delicious fuzzy fruits that grow in the garden. The gin has come out a wonderful, pale canary yellow colour and makes a divine gin and tonic. It is in fact so delicious that it deserved a mix up of its own, something to complement the quince’s distinctive flavour. I love using herbs in drinks and puddings and I wanted to add a botanical twang to this drink. 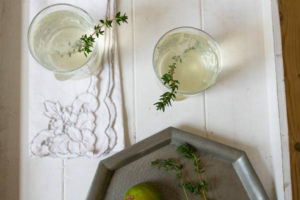 A Lime, Thyme and Quince Gin Cocktail is the way forward. Trust me. Roll your lime ferociously before halving and squeezing it out to get as much juice as possible. Put the juice into a small glass with the sprig of thyme. Muddle the lime and thyme together to release the oils from the thyme. Strain the infused lime juice into a serving glass. Add the quince gin to the lime juice and give it all a mix. Top up with tonic and serve. 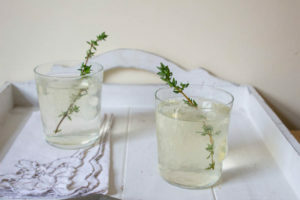 You can stick another thyme sprig in the glass to make it look snazzy if you like. I did. Yolo. If you’ve got ice cubes at your disposal then a couple would make a welcome addition to this drink. Considering this looks like quite a summery drink it screams of autumn flavours. Quince is such an autumnal fruit and woody herbs like thyme always make me think of slow cooking, roasts and chilly evenings. If you’ve not tried quinces before I thoroughly recommend you scour your local greengrocers or farmers’ markets to track some down; they are so worth finding. They have such a fantastic, almost tropical flavour which coupled with sharp lime and earthy thyme is a cocktail certainly worth trying. If you absolutely cannot find quinces you could always plant a tree, or failing that, you could use pears. Oh, I wish I could find quinces easily here. I would so love to make this! BTW, any recommendations for York or London? Will be in York pre-Christmas and London for the New Year. Hi David, plenty of recommendations – I shall hop over to your blog now! That sounds and looks like a lovely cocktail! Hi Caroline, every onc e in a blue moon we are able to find quince but not too often, looks refreshing. Oooh yummy! So much yes to this pretty looking lime thyme quince gin cocktail. I wish I could enjoy them right away. I totally remember than quince gin! Love this version as I’m a fan of any sort of drink with fresh herbs in it. 🙂 Also, I’m still chuckling over the idea of rolling the lime “ferociously”! Very nice your cocktail, refreshing and easy to make. You are very good at creating gins! I love your other recipes too. I don’t believe I’ve ever had quince gin! Love gin, so gotta remedy that. 🙂 Looks great — thanks! Quince is so underused and I love it! Great addition to this cocktail! I really liek the term you used: botanical twang! I agree some herbs are perfect in cocktials, a beuatiful one here taking the gin tonic up a few nothces. I love flavoured gins – sloe gin is my favourite at the moment but definitely need to try a quince version. Gorgeous! I have so much to learn when it comes to cocktails. This sounds great and that sprig of thyme is so nice. I need this in my life, can’t beat a good gin and tonic! I totally some of that quince gin in my life – this cocktail would take my gin and tonic game to the next level! I am a big fan of quince gin and I think this will be one of the best quince gin cocktail ever! What a wonderful drink with the making is not too difficult. And the flavor of lime and thyme is the perfect choice for a cocktail!